Toromont CAT - Div. of Toromont Industries Inc.
Toromont is acquiring Hewitt Equipment in a $1-billion deal. TORONTO – Toromont Industries today announced that it has entered into a definitive agreement to acquire the businesses and net operating assets of the Hewitt Group of companies in exchange for consideration of $917.7 million cash plus the issuance of 2.25 million Toromont shares (nominally $100 million based on 10 day average share price as at signing) for a total consideration of $1.0177 billion. Hewitt Equipment Limited is the authorized Caterpillar dealer for the province of Québec, Western Labrador and the Maritimes, as well as the Caterpillar lift truck dealer for most of Ontario. Hewitt is also the MaK dealer for Québec, the Maritimes and the Eastern seaboard of the United States, from Maine to Virginia. All amounts are in Canadian currency. “With the trend towards consolidation taking root in each of the sectors in which Hewitt operates, we are confident that our customers and employees will benefit from working within an even larger organization with access to even more resources and capital,” noted chairman and CEO Jim Hewitt. Upon close of the acquisition, Toromont’s Caterpillar dealership will operate 120 branches in Nunavut, Manitoba, Ontario, Québec, New Brunswick, Prince Edward Island, Nova Scotia and Newfoundland & Labrador, giving the company one of the largest sales territories in the Caterpillar dealer network. 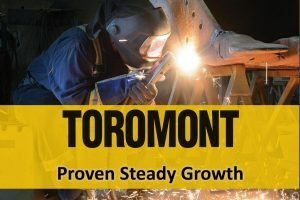 Toromont expects to maintain existing facilities and under its decentralized business model, regional leadership will continue to run their businesses locally to make decisions in the best interests of their customers. Toromont will fund the acquisition through current cash on hand, unsecured debt financing of up to $750 million and the issuance of 2.25 million Toromont shares (equating to $100 million based on the 10 day average share price prior to this announcement). A syndicate of financial institutions has provided Toromont with committed bank financing of up to $750 million to fund the acquisition and a revolving working capital facility of up to $500 million. Prior to close, Toromont intends to launch a bond offering (private placement) of up to $400 million and correspondingly reduce the draw on the bank financing. The transaction is expected to close by mid-October, 2017, subject to the timing of certain regulatory consents, including TSX approval, and customary closing conditions. More details of the acquisition are available at www.Toromont.com.